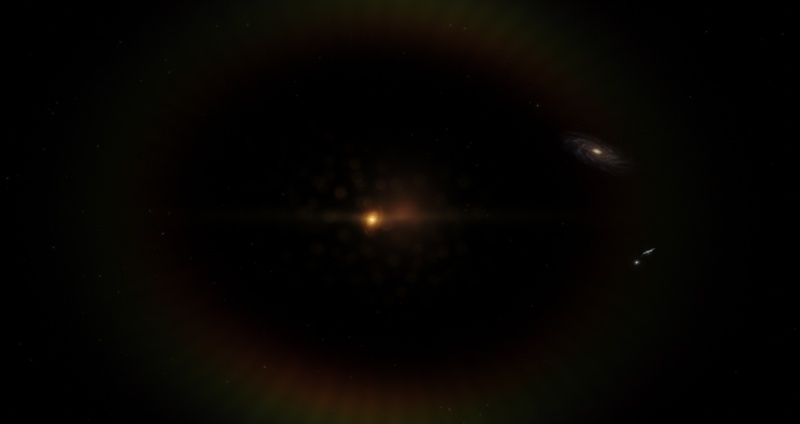 To install the addon you must put the attached file "Integalactic stars.sc" in your SpaceEngine\addons\catalogs\stars folder (create all the necessary route if you don't have it). - The addon cointains 28 catalogued stars that lie in the intergalactic space near the Milky Way. The stars are at least as far as Milky Way's satellite galaxies, the Large Magellanic Cloud (163.000 ly away) and the Small Magellanic Cloud (200.000 ly away). Listing the stars been at least 200 kly away from the Milky Way ensures that they do not pertain to certain galactic streams and that they in fact life in the extreme outer halo or in intergalactic space. - Many of the closer stars in the list are Hyper Velocity Stars (HVS) thus they will become intergalactic stars in the future (even ignoring the extreme distances they are right now). - Not all stars have been ejected from the Milky Way. For example HE 0437-5439 is an intergalactic star believed to have orginated in the Large Magellanic Cloud. - Some of these stars are Carbon stars, Blue horizontal branch stars, Blue stragglers and RR Lyrae variables. - Up to now the farthest known intergalactic star from the Milky Way is ULAS J001535.72+015549.6. It's nearly a million light years away, that is 4.5 times the distance to the Magellanic Clouds and 35% the distance from here to the Andromeda galaxy. I will update the addon in the future so it cointains stars closer but still way over the galactic disc to show some stellar streams and other regions of the outer halo. yay an exciting add on! Maybe in the future you can add the 3C Cambridge Catalog and I can finally get to see my favorite quasar- 3C 273! I assume we can't move time forward and see the hypervelocity stars zooming away can we? Do we have any rogue planets too? Source of the post I assume we can't move time forward and see the hypervelocity stars zooming away can we? A-L-E-X, as always, no. We have discussed about this in the work in progress thread and in the Gaia mission thread several times (we = you and me). 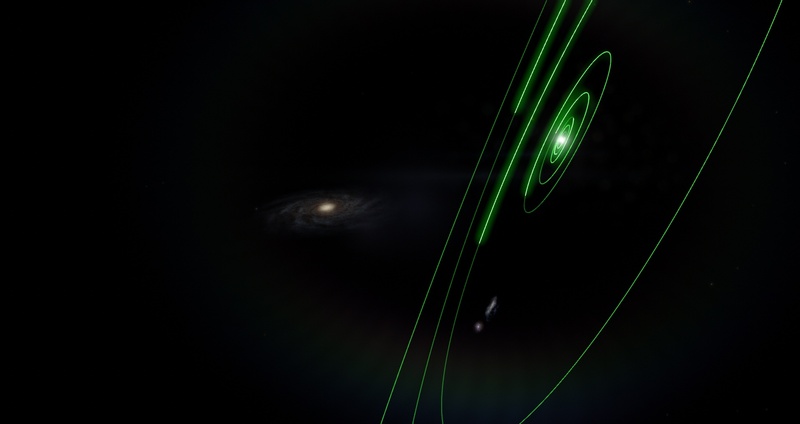 There is no stellar motion implemented in the code of SpaceEngine for now and to do it there are many many problems to solve before so it won't be possible at least for a few years. What I can do maybe is a script in python that when a date is given (let's say 5 Myr from now) it generates a file with the new positions for the Hypervelocity stars. If I do it (it could be possible only for a few stars) you would still have to 1) install python, 2) run my script, 3) generate the file for the date you plugged, 4) put the file in the corresponding folder and 5) reboot space engine (all of this for each year you want to see). Source of the post Do we have any rogue planets too? No, we currently don't know about any solitary intergalactic planet in the known universe (there has to be but we haven't observed any yet). In fact even planets around intergalactic stars are probably very very very scarce since for those stars to gain the velocity needed to overcome the gravitational pull of their galaxies their planetary systems have to be disrupted by the ejection. Supernova companions that can kick stars, gravitational slingshots with black holes and binary-bynary interactions are all disruptive mechanisms for the planets that those stars had in the past. The only possible scenario is by been thrown away by galactic collisions (stars in stellar streams shouldn't be totally depleted of planets in my opinion). Well it looks like I have the first reccomendation for a more realistic addon in the next update (erase all planets from this addon should be done). Well, first of all quasars are not currently modeled in SE so no, the addition is impossible for now. The only thing that can be done here is a catalogue of galaxies using 3C redshift measurements and sky coordinates, but those would be just normal galaxies until SE is capable of showing Active Galactic Nucleai and Jet streams. Second, what this has to do whatsoever with intergalactic objects or even stars? FFT I thought there might be a way just to model the motion of these hypervelocity stars, apart from what can be done in SE for anything else. Almost like an animation of sorts? Not to model every object, but just these select ones that move very quickly. FFT aren't there rogue planets traveling at faster than the escape velocity of the galaxy and will leave the galaxy in a few thousand years? I remember reading something about that. There were a few quasars in SE, I remember looking for a few very distant objects and finding them- one of them was called LMASS something or other (don't remember the rest of the name). There are actually quasar-like objects within our own galaxy, one well known one was discovered a few years ago, I forgot the name of that one. As always, thanks for your great work- just throwing some additional ideas out there! I don't want to get more off-topic here but since you ask I'm going to try to answer. Source of the post FFT I thought there might be a way just to model the motion of these hypervelocity stars, apart from what can be done in SE for anything else. Almost like an animation of sorts? Not to model every object, but just these select ones that move very quickly. I mean, this is a question for SpaceEngineer not for me. I don't know if it's possible and if it makes sense with the current developement of the code. The only thing I remember that Vladimir explained a few years ago was that this is not possible until a radical change in the core of the engine is made. Currently SE works like this: SE takes the coordinates of a point in space and uses it as a seed for a procedurall algorithm that generates (or not) the star, the system, and each of the characteristics. If it where another coordinate then the system would be generated in an entirely different way because the seed would be different. This has to be done like this because if the system parameters were not generated procedurally with a seed like this it would mean that you would probably have to store the information of the system in advance for eacho of the billions and billions of objects depicted in SE. The stars can't procedurally move for now because of this. They would change coordinates and the seed would be different each time. If you think about it it can be very complex issue. The other thing is the importance of this. I mean, I'm totally hyped by the ideo of having stellar motion in SE one day but making it for hypervelocity stars or making it for the rest of stars is not very different. The problem is the same. You also need to realize that in the case of hypervelocity stars even if the motion is huge you don't really have any close references to appreciate a huge motion. Ypu would see the galaxy like that, in the background for millions of years without much change in size. Better to implement all the scenarios and not only hypervelocity. Source of the post FFT aren't there rogue planets traveling at faster than the escape velocity of the galaxy and will leave the galaxy in a few thousand years? I remember reading something about that. I mean, yeah sure. There should be billions of intergalactic planets (probably much more than stars since stars die). The fact is that we haven't discovered any for now, so no catalogued ones can be added. Yeah it would be nice to have intergalactic planets when the engine is prepared to handle intergalactic stars. Maybe this is not that difficoult to add in the future. Source of the post There were a few quasars in SE, I remember looking for a few very distant objects and finding them- one of them was called LMASS something or other (don't remember the rest of the name). Ok. I thought the same a few years ago. But no in reality quasars are not yet implemented in Space Engine as HarbingDawn explained here. Quasars in SE are just an experiment yet to be worked. SE only shows a bipolar nebula object, not the full active galactic nuclei, with the jet streams that span galactic scales and other things that makes quasars what they are. Source of the post There are actually quasar-like objects within our own galaxy, one well known one was discovered a few years ago, I forgot the name of that one. There are micro-quasars in the galaxy, but these have nothing to do with quasars as astrophysical objects. Don't be misslead by the similarity of the name. Is almost like comparing a galactic disk with a protoplanetary disk. Yeah both are disks but not the same thing at all. Source of the post As always, thanks for your great work- just throwing some additional ideas out there! Oh, nice mod. I hope we can see procedural intergalactic star. PS : Your thread, is normal is create in Feedback and Suggestions or is just a error ? 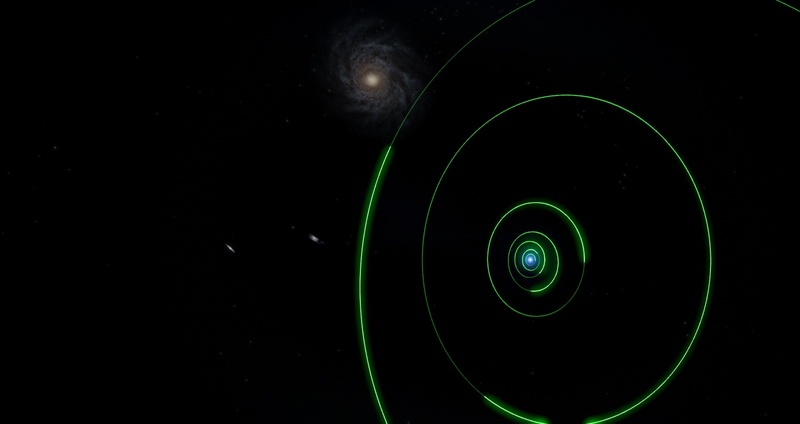 You should make an addon with the most distant galaxies. Thanks for the great addon! Enjoying exploring these systems. 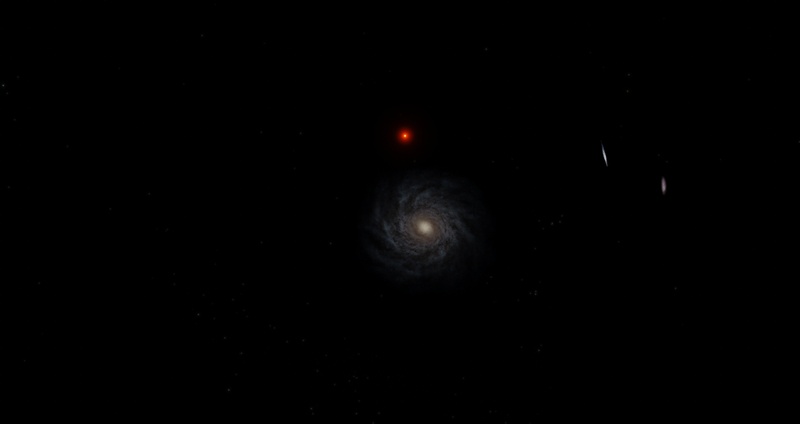 Anyone know if it's possible to find some of these stars in Space Engine? HE 0437-5439, ULAS J074417.48 + 253233.0 and ULAS J001535.72 + 015549.6. How do I find them, since in f3 they do not appear? They were mentioned in this forum, but I could never find them. Source of the post How do I find them, since in f3 they do not appear? You'll not find them unless you install the mod right on top of this page. Why is this addon in this section and not in the Mods&addons section of the forum?